I don't own too many metal puzzles, however a while back I spotted a rather interesting looking puzzle in the shape of a spiral galaxy on Puzzle Master's site. At the time it was out of stock, and it seemed that there were a few people looking for the puzzle. 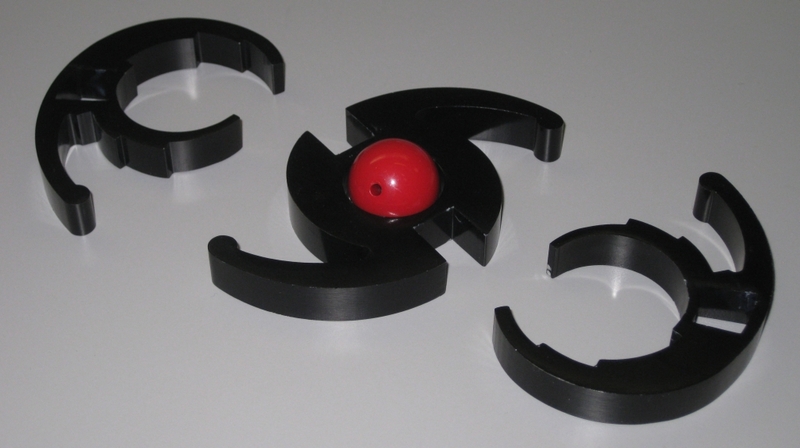 Puzzle Master now has it back in stock, so I picked up a copy of the "Great Collision"
The goal is to separate the metal pieces of the puzzle and release the red ball in the centre. Sounds like a fairly simple task however on first inspection, the pieces seem to be pretty well locked together, and there doesn't seem to be enough room to separate the pieces. 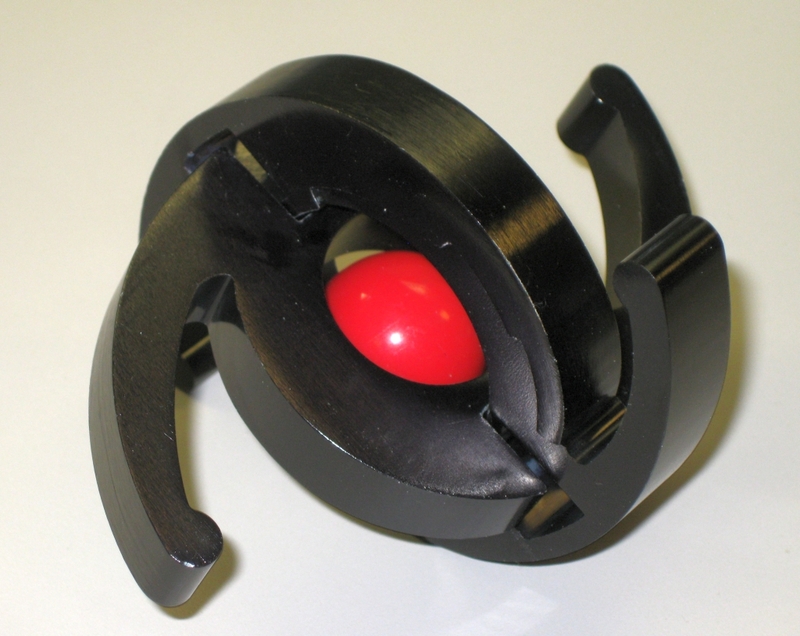 The puzzle looks great with the black anodised aluminium being well finished, and the red ball in the centre really standing out against the outer pieces. Measuring 4" in diameter, it's a good sized puzzle, and easy to manipulate the pieces. Given that it's solid aluminium it has a good weight as well. Much like the Yin & Yang puzzle I reviewed a long time ago, I think this is more of a good looking object, than a challenging puzzle. It can be a little tricky to get things into the correct position to allow them to separate, however there's little challenge to solving the puzzle. Putting the pieces back together is also fairly simple although I found it slightly more tricky. It is possible to force the solution; however if you find yourself doing that then it's time to think a little as there is no force required to solve this one, and the pieces will glide past each other if you're on the right track. You shouldn't need a solution, however if you do, you can download one here. Overall, this is a simpler puzzle which would suit a new puzzler, or a younger puzzler to get them more interested in puzzling. That said, it will look good on the puzzle shelves given that great contrast, and the striking black spiral arms.